I have a shade to share with you from the Sally Hansen Miracle Gel Pastel Punk Spring 2018 Collection! This is one of the lovely shifting shimmery shades the brand has been putting out lately and I love to see this kind of polish from a mainstream brand. Let's check it out. Sally Hansen Miracle Gel 043 Golden Glow has green-gold microflakes and pink-to-green shimmer in a clear base. I wore it in four thin coats and it can also be used as a topper. The finish is nicely sparkling and reflective. This has a medium dry time and I recommend thin coats to prevent bubbling. 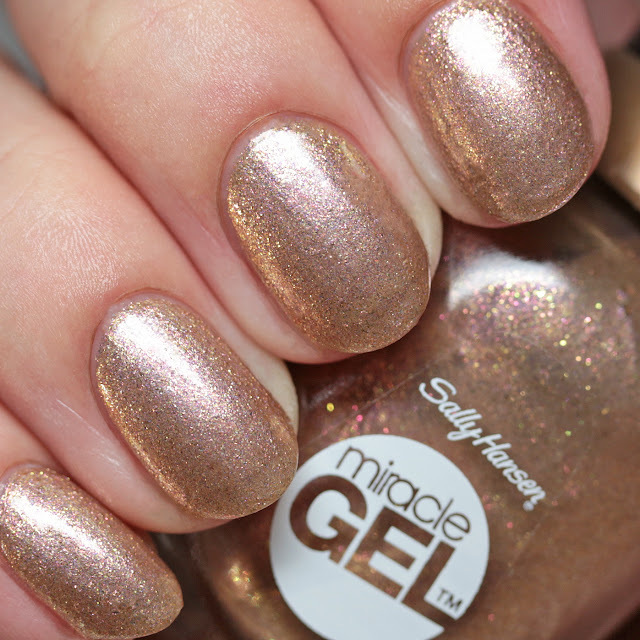 Sally Hansen Miracle Gel Golden Glow can be found online and in your local mainstream polish sources that carry seasonal collection. How do you like shimmery shades like this?